Rapidly changing environments mean leaders require strategies that seek shared organisational and societal value. We bring insight from different sectors and cultures as well as social, political, and technological trends and concepts to inform strategic planning or enhancement. We focus both on opportunity and risk. We have advised on strategy development for FTSE 100 companies, working closely at board or senior level, and managing stakeholder engagement in the process. We advise on the delivery of such strategies including policy development, integration between international operations, performance benchmarking, establishment of targets and key performance indicators, stakeholder relations, and the selection of evaluation and audit regimes and suppliers. Areas include brand development, carbon management and responsible supply chain management. We have advised public and voluntary organisations on their strategies, policies and programmes for influencing or engaging with business. We can produce methodologically-advanced reports to inform strategy. 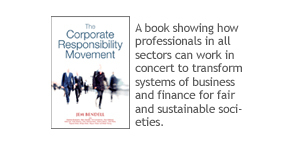 Our intellectual contribution to this field of practice includes the book The Corporate Responsibility Movement, which describes the emergence and importance of applying ‘movement thinking’ in effectively planning responsible enterprise efforts. To successfully respond to the social and environmental challenges faced today requires not only an appreciation of risk, but a creative outlook that sees the new opportunities to create solutions. This requires a passion for change, and constant exposure to different cultures and contexts, which we bring to our work on inspiring socially and environmentally positive creativity. Such creativity can occur within any business function, and inform or enact strategy. We have have inspired creativity in some of the world’s leading international organisations, helping them innovate new responsible enterprise and finance initiatives. We have also conceived ideas for clients which have led to the creation of successful new organisations. 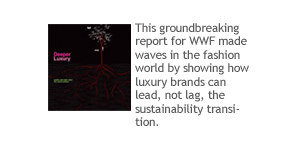 Our intellectual contribution to this field of practice includes a keynote speech at the International Herald Tribune luxury industry conference, which encouraged a emotional commitment to sustainability that will unleash sustainable design innovations. Scotcoin – an answer to Osborne? To be part of a solution to social and environmental challenges requires that those whom you depend on for your success join you on the journey. Leaders must therefore influence whole value chains, sectors and even systems of economic, social and political activity. We have helped clients communicate their responsible enterprise efforts through managing annual sustainability reporting cycles and writing annual sustainability reports (from concept to final publication), including 2 award-winning sustainability reports for multinational FTSE clients, and related web content. We have helped clients by conceiving, creating and executing sustainability-related campaigns to generate millions of dollars of editorial press coverage for an outlay of less than 40,000 pounds. We write books, UN reports, magazine and newspaper articles, popular blogs and academic pieces, and make keynote speeches, that generate significant media coverage worldwide and are influential in our field. 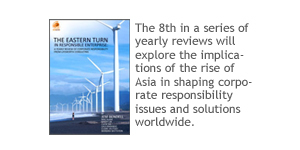 We publish an annual review of responsible enterprise that is well read by relevant professions. We can also leverage the two professional social networks we have founded and the 4000 members of our jobs bulletin on responsible enterprise. Our intellectual contribution to this field of practice includes the report Tipping Frames, which explains how the responsible enterprise field is a place for the reconceptualising of cognitive frames shaping society and business, and how to use that for positive outcomes. Different organisations in different sectors – public, private and civic – have different competencies and networks than can be combined to deliver change at the scale and pace that is required by today’s challenges. To do this effectively requires advice from those who understand each sector and know when and how partnerships can succeed or fail, and act as a trusted interlocutor. We have connected international NGOs to create new organisations, UN agencies to environmental NGOs to launch a fashion show, sovereign wealth funds to responsible finance initiatives, and helped business schools, companies and sovereign wealth funds to join UN, NGO or multi-enterprise initiatives. We develop stakeholder engagement programmes, from the head office of UK-based FTSE 100 client, to a site level stakeholder relations plan for a gold mine in West Africa. We have created two successful professional networks that provide the opportunity for people to connect. CSRGeneva.org and AuthenticLuxury.net each convene around 500 members in active on-line communities that also meet regularly. Our intellectual contribution to this field of practice includes Partners In Time? 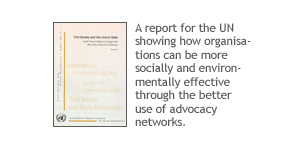 which was the first UN report on business-NGO partnerships for sustainable development. The past decades of management education have encouraged specialisms that do not help us to see the whole system of an organisation, value chain, sector or society. To navigate the rapid changes in environment, society, economic, politics and technology, executives can benefit from experiential, transdisciplinary, heart-felt and practical education, which also provides them with new contacts and ideas. We developed and teach masters level education for responsible enterprise at universities in Australia, Singapore, Switzerland and the UK. We have developed and delivered intensive sustainability training courses, for companies in Spain and Sweden, for instance. We have run workshops at corporate responsibility conferences around the world. We are currently developing a network of social and environmental entrepreneurs, who are willing to host study tours of their premises, in order to offer this as part of our educational programmes. 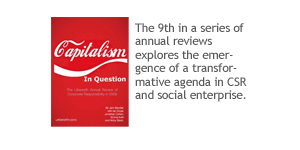 Our intellectual contribution to this field of practice includes commentary on business education and research in a quarterly column in the Journal of Corporate Citizenship. These services are applied in our work programmes, including Authentic Luxury, Enterprise Trends and Engaging Change.